UPDATE: Kansas City Royals general manager Dayton Moore announced on Tuesday that Joakim Soria has NO structural damage in his shoulder. This is great news. A couple of weeks rest and some ibuprofen should do wonders. ALSO: I'm in the same boat as everyone else who picked up Luke Hochevar and suffered a terrible blow to their ratios. Hopefully start two goes much better. When the Royals placed Joakim Soria on the disabled list and moved Sidney Ponson (their only struggling starter) to the bullpen it created an opportunity for two players. Juan Cruz will be the interim closer for the Royals. Oh, they say it will be a committee but Cruz should see the majority of save chances. And Luke Hochevar, who was making the PCL look like Little League, joins the major league rotation. It has been obvious that there was something up with Soria, almost since the start of the season. He has pitched just about the bare minimum for a closer. The shoulder soreness has not seemed to affect his pitching when he has taken the mound which is hopefully an indication that the injury is not that debilitating. The Royals seem to think that a couple of weeks rest should do the trick but they are not saying much about it. We can only hope that they have taken all the appropriate steps to protect one of their best pitching assets. Soria should be held in every type of league. The temptation to make a panic move this time of year is huge but I encourage all owners to relax and find the best replacement possible. If you are a Soria owner hopefully you might be lucky enough to pick up Juan Cruz. Cruz is an excellent pitcher who has been considered a great potential closer for years but has seen few opportunities. Cruz has not been at his best this season. His walk rate (always a little bit high) has elevated to 5.65 thus far this season. His strikeout rate is also a bit lower than usual at 6.91 compared to his 9.28 career average. Cruz is also a flyball pitcher who is inducing even fewer groundballs than usual. Fortunately, none of his weaknesses are showing in the results so far which means even though he is off to a shaky start his luck has improved. His FIP of 4.43 (1.88 earned run average) shows you the level he has pitched this season. Although you might normally scoff at picking up a reliever with so many bad indicators it should only be for a few weeks (we hope) and he'll collect valuable saves in that time. The pitcher that every fantasy owner on the planet either tried to pick up or wished they could have over the last few days is Luke Hochevar. Hochevar flashed his ability in an otherwise mediocre debut season in 2008. The Royals banished him to triple-A this season to experiment with Sidney Ponson (lunacy I know). 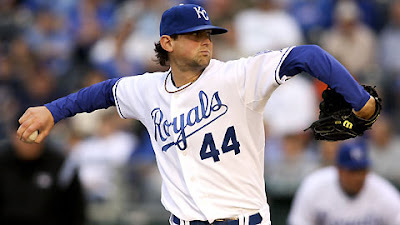 While Sidney Ponson was accumulating his typical numbers (on the bad side of mediocre) Hochevar was proving that he did in fact learn a few things in his 22 major league starts. In his six minor league starts this season pitched to a 0.90 ERA (3.10 FIP) by showing improved control and a little luck. Hochevar is a extreme groundball pitcher with a good strikeout rate (expect something between 6.00 and 7.00) and very good control. The PCL is a hitters league and Hochevar's dominance in triple-A has mirrored Zack Grienke's in the majors. That is not to say I believe Hochevar will continue to be this good in the majors. I do believe that he will be a very good major league pitcher this season. He may have the typical ups and downs that young pitchers experience but all in all he should be worth picking up in leagues of all sizes and types.